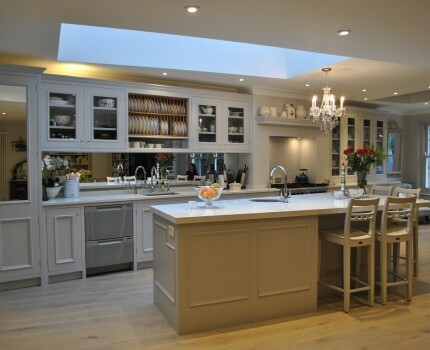 Shaker Style Kitchens, Bespoke Kitchens Designed in London. 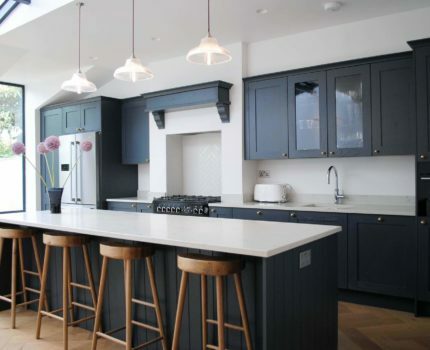 We specialise in designing, constructing and installing our bespoke shaker kitchens using high density Furniture Grade moisture resistant MDF or solid wood as our base material. Our shaker style kitchens are machined and assembled in a dedicated workshop by professional cabinet makers using the finest fittings and accessories. Each shaker kitchen is made to order and is unique in its design, with your special requirements and equipment incorporated. The kitchens are delivered fully assembled and painted, or doors primed ready for painting on site. 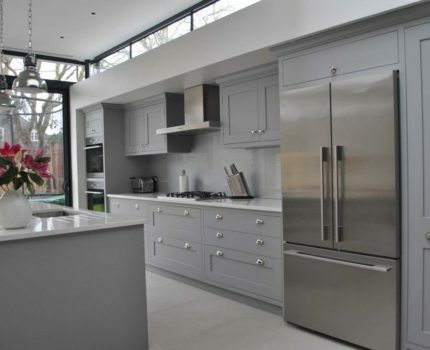 Eclectic Interiors is a kitchen designer in London that provides modern or traditional bespoke kitchens with outstanding service and after sales support. We provide both traditional shaker kitchens and modern shaker style kitchens. Cabinetry can be hard wearing melamine MFC or wood. Our cabinet construction methods are also different as we do not use a double frame between cabinets and this gives a much cleaner look than other makes of this style of kitchen. We are a London Kitchen Designer that can also design and create kitchens in custom hardwoods including Oak and Walnut. Our bespoke Shaker kitchens range in price from £8,000 to £40,000. Shaker kitchens are the most popular choice for many of our clients. Our kitchen design team will create you a bespoke kitchen with your design choices in mind to create the perfect space to cook and entertain.